We here at Men on the Move have been helping people move to and from Dearborn frequently these last few years, and with the perks Dearborn offers we understand why. Dearborn hosts great things such as Greenfield Village, The Henry Ford museum, the Arab American Museum, and Automotive Hall of Fame. All of these plus the good school system and close knit neighborhoods makes Dearborn a wonderful place for families and single people alike. 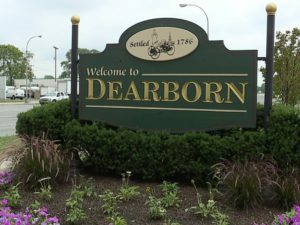 Here is a little more information about the city that will prompt you to look for movers in Dearborn. Dearborn is the 8th largest city in Michigan and is part of the greater metropolitan Detroit area. First settled by French farmers in the 18th century back in Michigan’s early days. Dearborn was originally founded in 1786 and later incorporated in 1929 and has grown to host a population of 98,000. Since then has grown into one of the largest cities in Wayne county with a diverse population. Located right next to the West side of Detroit, Dearborn shared a border with this great American city. Dearborn is also East of Inkster and North of Taylor and Allen Park. To the North is Dearborn Heights and is close to other major cities like Livonia Dearborn has four major highways that run through it. Since then has grown into one of the largest cities in Wayne county with a diverse population. Located right next to the West side of Detroit, Dearborn shared a border with this great American city. Dearborn is also East of Inkster and North of Talyor and Allen Park. To the North is Dearborn Heights and is close to other major cities like Livonia Dearborn has four major highways that run through it. Dearborn housing values have been going up in the last few years while median income has remained low. This area has been perfect for first time home buyers or people looking to move from downtown to a near by suburb. With a low cost of living, affordable housing, and amenities at your fingertips, many people choose to make Dearborn their home. Men on the Move can help with your next move to Dearborn. We’re a local mover near you with the experience and know how to get the job done. Also, we are one of the most highly recommended movers in Dearborn. Our offices are located in Ann Arbor, Livonia, and Westland and can easily help you with your next move. We also sell packing materials! Finally, when searching for movers in Dearborn, make sure to hire the professionals at Men on the Move.